We love finding cool camping gear! 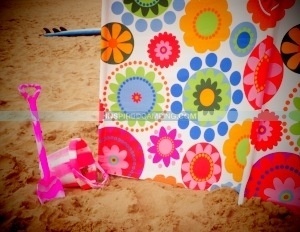 One we’ve discovered and had the pleasure of reviewing recently is Devon Daisy handmade windbreaks. If you live near the sea, as we do, or like to go camping near it then you will understand the need for a windbreak. They can make a chilly time at the beach or the campsite that much more enjoyable by cutting down the wind and creating a warm area to shelter in and bask in the sun. We’ve used the regular kind but have always been a bit disappointed about their boring design and lack of choice over colours and patterns. We’ve also experienced badly made cheap windbreaks, which break easily when hammered into the ground. As the name suggests, Devon Daisy is a company based in Devon UK. They hand make their windbreaks and offer an interesting choice of colours and fabrics. 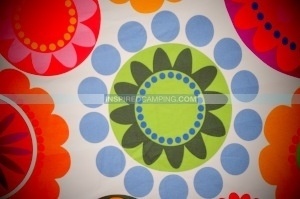 When discussing their design with fellow campers it was agreed that the fabric was of good quality and made the perfect accompaniment for glampers and campers alike. They particularly suit those with vintage and retro tastes, and would go perfectly with a renovated vintage caravan or VW campervan. 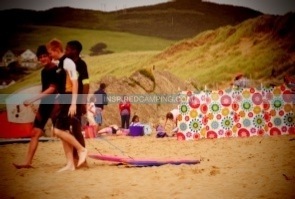 While using the windbreak at the beach we were approached by a couple of beach goers who loved the design, that clearly stood out from all the rest. We particularly liked the fact that the wooden poles were topped with metal to avoid them splitting when hit by a hammer to secure it. Hopefully this detail will improve the life of this cool camping gear significantly to the others we’ve owned. It also comes with a handy bag and carry strap, perfect for taking it to and from your location and stopping any sand or mud being spread around by the poles. One comment from a campervan business owner who saw it was that as they were a handmade product it would be really useful if his own company logo could be put on it so that when they were set up at shows it could be a good PR tool as well as eye-catching and useful. In fact the possibility of this company working with the unique cool camping and glamping industry could result in many useful PR partnerships in the future to their mutual benefit. The material seems durable and hard-wearing and comes with a bag in the same design, perfect for being lugged around with your camping gear on the campsite or for a trip to the beach. The added bonus is the material is washable, which is very handy if you have any mishaps. 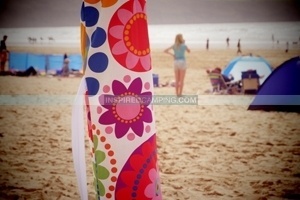 The designs available are great for the unique cool camping industry, for glamping or simply wanting to stand out from the crowd on the beach or at the campsite. The metal ends protect the wooden poles when hammering them into the ground, making this a better quality windbreak than most. For a handmade item, it is not overpriced as they range from £35 – £49.99 (Approx. $57-$80). They can also be purchased without the poles if you already have some of your own, which helps to bring the price down even further. We couldn’t find any, but one comment we did have from one person on the beach was that it was a shame the pattern wasn’t double sided. However to provide this would increase the price significantly. 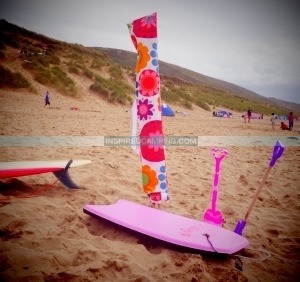 This is a great handmade product that we’re happy to give 4 stars and we hope to be seeing many more of Devon Daisy’s windbreaks around in the future. If you have a product you would like us to honestly and thoroughly review in a future article we’d love to hear from you so please say hello. One more thing, don’t forget to sign up for our free updates and bonuses. It’s free, you can unsubscribe at any time and it will give you access to our regular prizes and giveaways.